Colombian arranger/composer Lucho Argain (born Luis Guillermo Pérez Cedrón) made his first record in 1959 after signing up to Antonio Fuentes Estrada's label Discos Fuentes. Soon, the talented musician and the visionary entrepreneur teamed up to assemble a major orchestra inspired by the success of Cuban Sonora Matancera. Unfortunately, the original group disbanded in 1963. In 1975, Julio Ernesto Estrada Rincon, also known as Fruko, re-formed Sonora Dinamita. 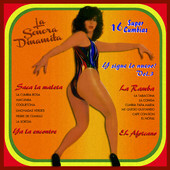 In 1981, La India Meliyará became their leading vocalist, making successful records, including the Cumbia classic "Mi Cucu."